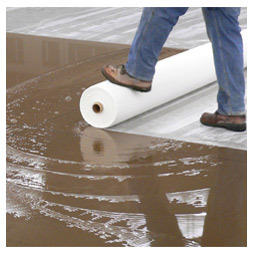 UltraCure concrete wet curing blankets are composed of natural cellulose fibers which are related to the materials used to create disposable diapers. All other wet curing blankets are made of synthetic non-woven fabrics or burlap, which do not have the ability to retain moisture as well as natural cellulose fibers. The ultimate goal of any wet curing blanket is to maintain a 100% relative humidity condition on the slab surface for the entire curing period. Synthetic fabrics must have water reintroduced to the surface each day or have bleeder hoses as part of the curing process which adds time and labor. 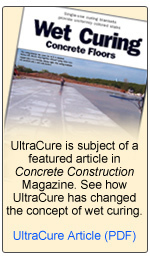 The super absorbent qualities of the UltraCure family of products are capable of absorbing, holding, and wicking water to the slab surface as needed for the entire curing period. The wicking action also means the blanket will stay on the slab without the use of tie downs or weights. UltraCure blankets are single-use products which are disposed of along with other construction debris. 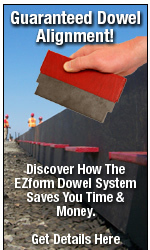 This prevents chemicals and impurities from being transferred from one slab to another, and can help with green points.